Sometimes indoor cats like to look out and see their outdoor counterparts moseying through the yard. However, there are cats that become upset, angry, and agitated when there is an outdoor interloper around. The cats that get upset about an outdoor cat hanging about might feel territorial and wish to fight, or they might be excited and want to get out and play with the visitor. What Can Happen If an Outdoor Cat Upsets Your Indoor Kitty? When cats are stressed, they might develop negative behaviors like scratching or urinating inappropriately. Sometimes the inappropriate scratching will be directed at doorways or window frames leading to the outside. Cats upset about interlopers outside might also indulge in redirected aggression. When that happens, your cat might begin attacking you or other pets in the household because she can't get to the real target of her frustration. What Can You Do to Help Your Cat? Do what you can to limit your cat's view of the outside area. You may wish to cover windows and move cat condos out from in front of them. Hopefully, this can be a temporary situation, and your cat will be able to enjoy the outdoor view again once the situation is resolved. 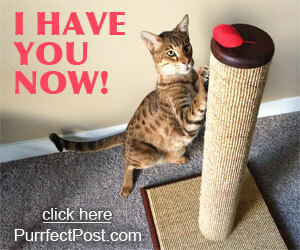 Increase your cat's interactive playtime. Help her get her frustrations out in a safe way by letting her play with wand toys and chase rodent toys more often. Encourage her to use her scratching post more. Scratching is a natural way for cats to show other cats their territory and also physically relieve stress. 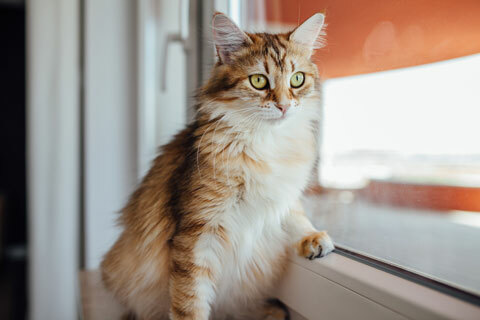 You may try placing a scratching post near the area of the home where your cat can see the outside visitor, so she can scratch at it vigorously to feel better when she sees him. 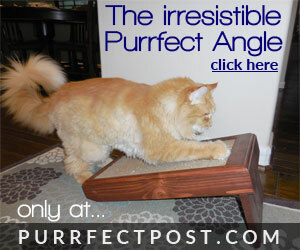 An angled scratcher at the base of the post can help, too, so your cat has options of how to scratch to get the best results. Discourage the outdoor cat from coming around. You can do this by installing motion detecting sprinklers or a motion detecting ultrasonic sound machine. Feliway can help your cat stay calm. It is a compound that mimics the feline calming pheromone that is released from the facial area of mother cats. You can spray or diffuse it in the area in which your cat seems to get upset to help her stay calmer. The most important thing to do when your cat is being bothered by an outdoor cat is to remain patient with your kitty. Getting upset, yelling at her, or otherwise reacting negatively will increase her stress and could make matters worse.